Times are changing indeed. If you’re thinking about popping the question and surprising your love with the “perfect” engagement ring, you might want to think again. These days, tradition has taken a backseat to a preference for womens rings. It seems women are no longer shy about their desires, and this includes the engagement ring of their dreams. And why should they be? This ring will grace her finger for many years to come and therefore should elicit a wide grin each time she gives it a glance. Diamonds are forever. Diamonds are also a girl’s best friend. And if you’re not quite sure what diamond your love may desire most, it may be time to ask. Womens rings are no joke. The old process of a man surprising a woman with a diamond ring is undoubtedly romantic, but not quite so practical when diamonds cost thousands and women know exactly what they want, as pictures of celebrity engagement rings are readily available with a simple click. According to recent findings, more and more women are happy to chip in for their dream engagement ring, much to the delight of many a man strapped for cash in this trying economy. According to wedding website The Knot, more than 60% of women admit to having some input in their ring, with many of them volunteering to share the expense. This team player mentality is a practical one, albeit slightly less romantic than during the old days where women were simply thrilled with whatever womens rings were presented. One-third of engaged women report having set a ring budget with their partner. During a time where plenty of women make as much, if not more, than their significant others, the idea that the responsibility lies solely on men is unproductive at best. Womens rings have long been a symbol of status, and when women want an extravagant ring that is exactly their taste, it seems there is no good reason keeping them from achieving it. Womens rings are no small expense, and there’s no denying that two bank accounts are better than one. With today’s average engagement ring topping $5,400, it’s no wonder couples are exploring alternatives outside of the traditional model. There is far more to be settled than the subject of rings. With an engagement ring comes a wedding, and today’s couples are well aware of the enormous expense throwing one of these shindigs can be. As the average weddings cost nearly $30,000, it seems couples are choosing to spare coin wherever they can—a wise choice when you add marital expenses like mortgages, automobiles, children and insurance. Juno Jewelry is committed to providing a superior shopping experience for our valued customers, in addition to a gorgeous, wide selection of engagement and wedding rings to choose from. Diamonds are forever, and when you shop with Juno Jewelry, you can rest assured your diamond will last an eternity. 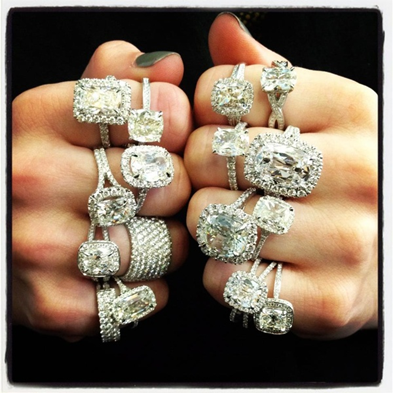 Call or order from Juno Jewelers online today to begin the process of sifting through our huge selection of womens rings, engagement rings and wedding rings.